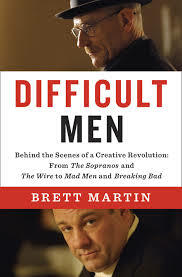 Breaking Bad is done, but if you want to have great insights into where a show like it came from, read Brett Martin’s book Difficult Men. It is a history of what is being called the third golden age of television. An age ushered in by shows like Oz, The Wire, The Sopranos, and continued by Mad Men and Breaking Bad. I listened to the audio version and drove out of my way some days so I could hear an extra 15 minutes. This entry was posted in Art, Books, Culture, World and tagged breaking bad, Brett Martin, Mad Men, Sopranos, Television program, Vince Gilligan, Walter White by RonKJones. Bookmark the permalink.